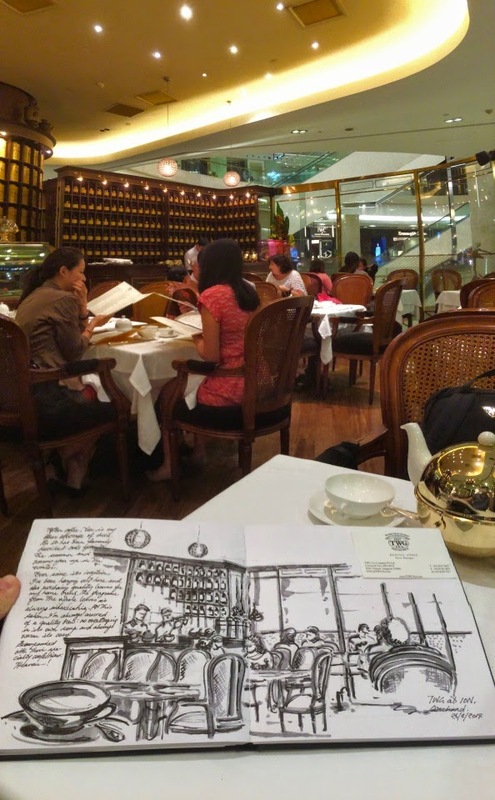 As I started on my café personal sketchwalk last December, one of the first places I went was TWG at Ion. 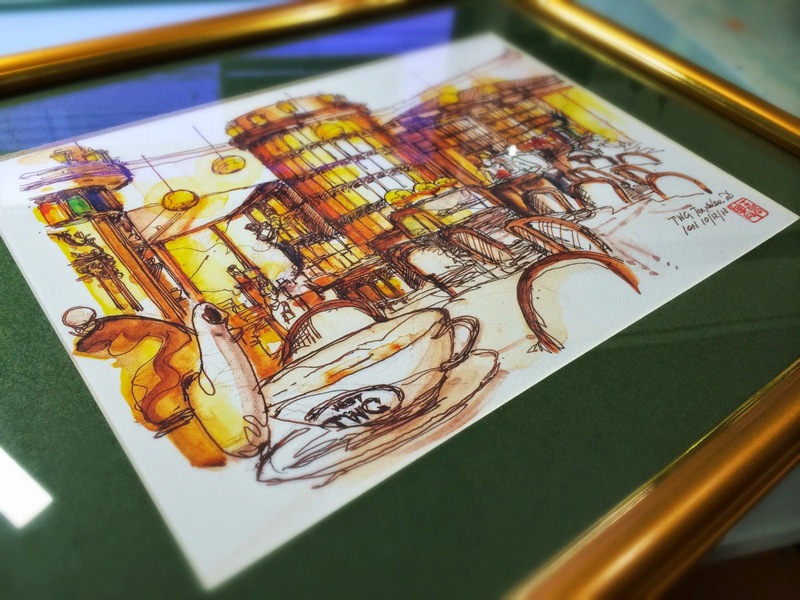 Serving perfectly steeped tea in a cosy, it has always been my favourite haunt for a delicious pot of brew. 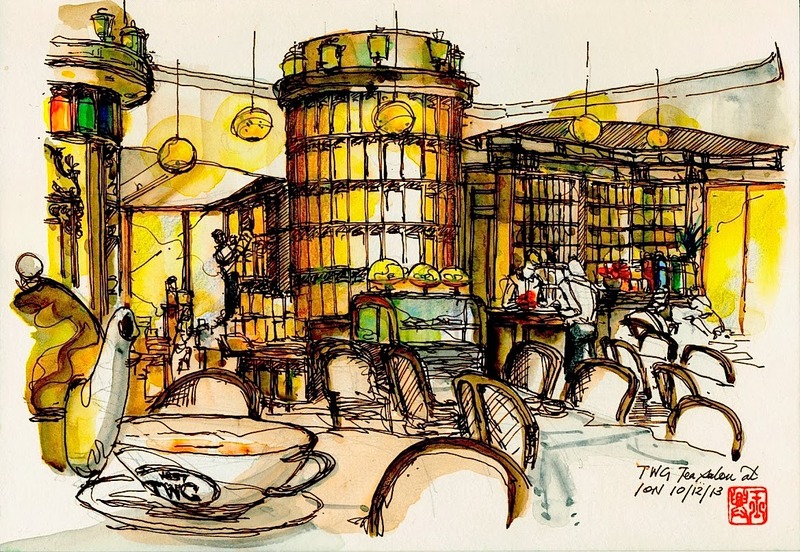 When I was there for the sketching session, I caught the attention of Kenneth, a very enthusiastic and warm tea-sommelier. While conversing (how I miss this a lost art of eloquent dialogue), he brought me along on a wonderful discovery journey on the subject of tea. We were later joined by the manager-on-duty, Jeffrey, who also added lavishly to my education of and acquaintance with the camellia sinensis. Such was the extent of their hospitality that they generously offered a complimentary pastry that I may complete my sketch in the delicious comfort and company of their conversation and confections. When I was done with my uncoloured sketch of the salon and was about to leave, I promised to return to show the completed, coloured version of the drawing. May I just say that I have never come across a more enthusiastic recipient of my art or any gift, for that matter. For that, I want to thank Kenneth, once again for his professionalism and hospitality. Additionally, I want to thank Nina as well, for her warm reception and generosity on my last visit. I believe, I shall be visiting the salon again, very soon. Anyone interested in joining me for a fine tipple…?